Do you live in Rancho Bernardo and have a bee swarm? Look no further than D-Tek Live Bee Removal for all your bee control needs. We are a San Diego local live bee removal company located in North San Diego County. We specialize in the safe and humane removal of honey bees from your Rancho Bernardo home or business and relocate the bees to our own San Diego beekeeper operation. How do we do this? We have a custom designed vacuum system that gently removes them into a holding chamber. We then transfer them into a bee hive box and drop them off to a professional beekeeper in San Diego. By choosing D-Tek Live Bee Removal you can be assured that your bee swarm will be taken care of quickly and professionally. All of the above mentioned steps are very important in the live bee removal process. However there are two that critical. The first one is the repair work portion of the bee removal. Honey bees will often times build their hive in attics, walls, sheds, etc. To completely remove all of the honey comb and it is often necessary to cut into a roof, stucco, wall, floor, drywall, etc. Any roof, stucco, or siding repairs we perform are guaranteed to be free from defects and are guaranteed not to leak. Any drywall repairs performed by D-Tek Live Bee Removal are guaranteed to blend seamlessly with the surrounding area. The other critical step in the live bee removal process is the complete removal of all honey comb and bee hive. Honey bees have an excellent sense of smell. If all of the bee hive and honey comb is not removed the smell of it will attract honey bees back to the area for years to come. There are many pest control companies in San Diego that will come to your home or business and spray pesticides to kill the bees. They will more often than not remove any of the honey comb from the structure. Another risk involved with not removing the honey comb is that once the bees are no longer alive to tend the hive the honey will melt out. This can cause damage to drywall, stucco, framing, electrical wiring, siding, etc. As you can see it is very crucial that the bee hive removal be done properly by extracting all of the bee hive and honey comb to avoid damage to your home or business in the near future. D-Tek Live Bee Removal is fully insured. We offer a copy of our insurance to all of our customers. D-Tek Live Bee Removal also offers free estimates and inspections. Once the bee hive removal has been completed and all the bee removal repairs have been completed it is time to bee proof the structure. This is also referred to as bee control. 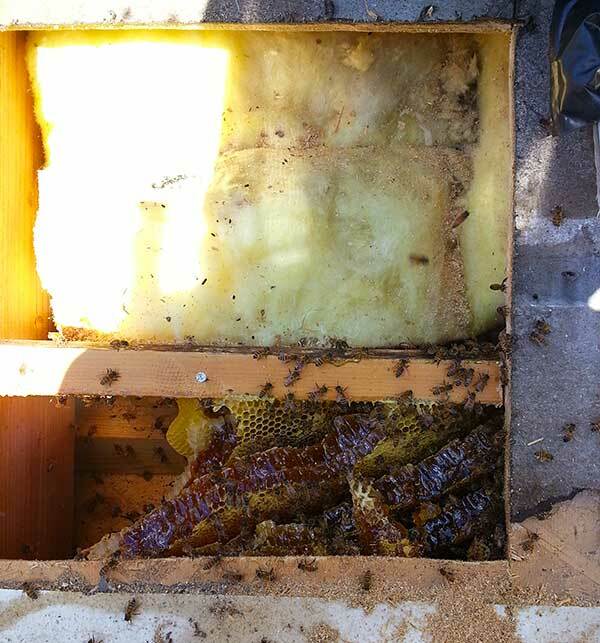 One of our expert technicians will seal up the original entry and exit points of the bee hive and also bee proof the area in a 10 foot radius around the original entry/exit point. D-Tek Live Bee Removal also offers whole home/business bee control services as well. We will do a inspection of the entire premises and find every vent, crack ,crevice, etc and make sure it is properly sealed so you never need bee removal services again! D-Tek saw a need for additional beekeepers in San Diego and we are proud to announce we’ve opened up our own beekeeping operation. After we have completed the live bee removal in Rancho Bernardo our drop off point is to our beekeeping farm. Our extensive 45 hive bee farm helps to pollinate nearby orchards, crops and gardens. If you want your bee removal in Rancho Bernardo to be handled by the pros give D-Tek Live Bee Removal a call today! The owners direct line is 760-224-3040. If we do not answer please leave a message and we will call you back ASAP. Sometimes hearing the phone ring in the bee suit can be a challenge. We can also be reached by emailing us and we will get back in touch with you as soon as we receive your info. The professionals at D-Tek Live Bee Removal can usually have your bee swarm resolved within 24 hours of first contact.